PORT MOODY, BC – Twin Sails Brewing has announced the return of one of its “OG IPAs”. Slam Dank was our first venture into the dank side of IPAs. It is double dry hopped with large amounts of Mosaic, Apollo & Columbus. The light biscuity grain profile allows the dank, hop aroma to be fully showcased in this beer. Expect big resinous, earthy, marijauna like aromas to be dominant with a hit of candied tropical fruit on the palate to balance it out. 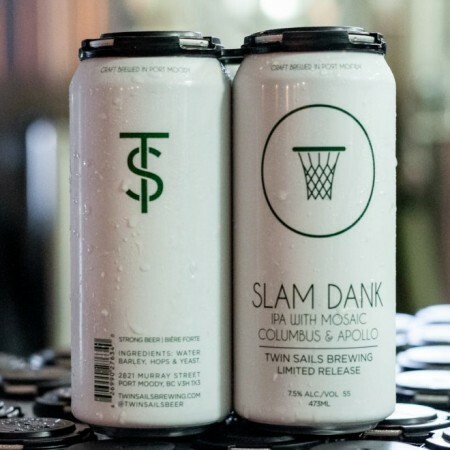 The new batch of Slam Dank is available now in 4-packs of 473 ml cans at the Twin Sails retail shop, and soon at local liquor stores.